Shards of War tells the amazing story of a brother and sister still in their teens who escape the town of Dubno, Ukraine in June of 1941. The German Army surprised the Soviet Union at this time with an invasion that killed most of the Jewish faith who lived in the Ukraine. Many, mostly young people, fled the town and went into the Soviet Union and Central Asia. This is one such story of Michael, 16, and his sister Luba, 19, who fled their home in Dubno just ahead of the German Armies. Into the Soviet Union they ran, and went even further into the Ukraine. The siblings ran on foot and by train into the Ukraine and beyond, and spent a horrible winter in a town near Stalingrad in Russia, where they nearly died of cold and hunger. The sibling's story of courage and loss is portrayed - sometimes in horrible details - as an improbable survival situation of Polish Jews who went on to live their lives in other countries but, never forgot the bias and prejudice they had to live through. The excitement (if you can call it that) and the state of uncertainty, go on until the summer of July 1942, when once again the Germans are on their way to Stalingrad. At this point, Michael and Luba have to venture east to Uzbekistan, where they survive by their perseverance. When the war ends, Michael and Luba return to their hometown and find it demolished, and learn that all of the 8000 remaining Jews have perished and are buried in mass graves. Most all survivors are like the two teens - young enough and able enough to escape. This book is an emotionally filled account of the almost impossible survival of a handful of Jewish people who escaped into Russia, and then had to escape again when the advancing German Armies came at them, only to return at war's end to discover no one left alive. 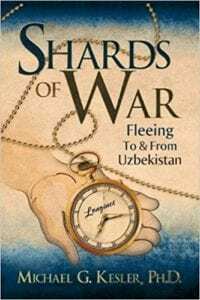 Shards of War is truly a very unusual story told in the first person of survivors of the Holocaust. Quill Says: An extremely well-written book that tells the tale of an extraordinary pair of siblings who looked at the end of their lives, and did something about their inevitable deaths. Readers will be astounded by the first person account of survival of these two during the closing years of World War II.